An intergalactic gas cloud is sometimes a dish best served cold. In a new study published June 9 in the journal Nature, a Yale-led team of astronomers found a supermassive black hole about to devour clouds of cold, clumpy gas hurtling toward it. Prior to this, scientists believed that supermassive black holes in the largest galaxies fed on a slow, steady diet of hot, ionized gas from the galaxy’s halo. The discovery offers new insight into the way black holes ingest fuel, a process called accretion. The most common way for black holes to feed is by taking in hot, ionized gas that spirals in slowly from a surrounding disc of cosmic material. Tremblay’s team analyzed data from the Atacama Large Millimeter/submillimeter Array (ALMA) telescope in Chile to map the locations and movement of cold molecular gas in the Abell 2597 Cluster — a knot of about 50 galaxies located 1 billion light years from Earth. The researchers detected a trio of cold gas clouds, traveling as fast as a million kilometers per hour, heading toward a black hole in a galaxy at the center of the cluster. Each gas cloud contained as much material as a million Suns and measured tens of light-years across. “We can’t know whether all or only part of this ‘meal’ of cold gas will ultimately fall into the black hole, but the ALMA data spectacularly highlights the importance of this kind of cold accretion,” said co-author C. Megan Urry, the Israel Munson Professor of Physics and Astronomy at Yale. 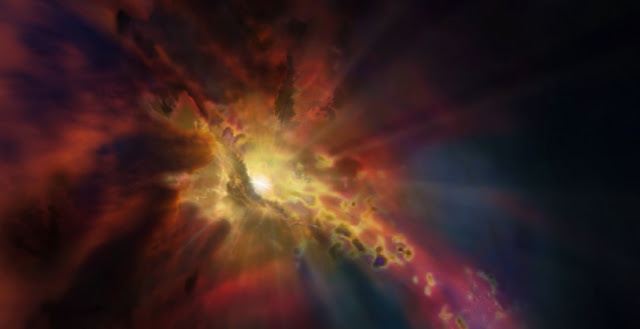 Additional data from the National Science Foundation's Very Long Baseline Array indicate that the gas clouds observed by ALMA are approximately 300 light-years from the central black hole, essentially teetering on the edge of being devoured, in astronomical terms. The researchers said they plan to use ALMA to search for similar “rainstorms” in other galaxies to determine if such cosmic weather is a common phenomenon. “It was magical being able to see evidence of these clouds accreting onto the supermassive black hole. At that very moment, nature gave us a clear view of this complicated process, allowing us to understand supermassive black holes in a way that has never been possible before," said Timothy Davis of the Cardiff University. The international team also included researchers from the Massachusetts Institute of Technology’s Kavli Institute for Astrophysics and Space Research, the Rochester Institute of Technology, Michigan State University, the Harvard-Smithsonian Center for Astrophysics, the Naval Research Laboratory Remote Sensing Division, the University of Michigan, the University of Rochester, and institutions in Germany, the Netherlands, France, Canada, the United Kingdom, and Mexico. This observation is nowhere near the hypothetical Black Hole. 200km/s is far from a significant fraction of the speed of light near the gravitational radius (GM/c2). The cloud angular momentum will almost certainly cause them to miss such a small target. If the accretion region is far more extended, it's misleading to talk of devouring the clouds directly. It's also misleading because only structures extending outside GM/c2 can accrete matter in finite time, a gravastar structure. This observation is nowhere near the hypothetical Black Hole. 200km/s is far from a significant fraction of the speed of light near the gravitational radius (GM/c2). The cloud angular momentum will almost certainly cause them to miss such a small target. If the accretion region is far more extended, it's misleading to talk of devouring the clouds directly. It's also misleading because only structures extending outside GM/c2 can accrete matter in finite time, a gravastar structure. The bright jets cannot be coming from a Black Hole, as no matter can emerge from these 'objects'.